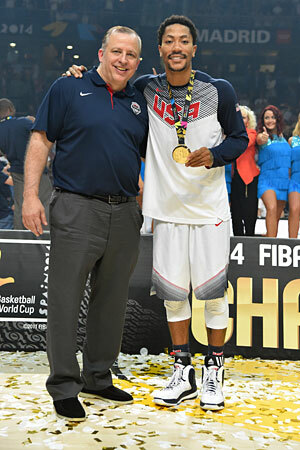 MADRID–Derrick Rose concluded the USA’s gold medal winning journey through the FIBA Basketball World Cup Sunday night in this decorative Castilian capital city with his second scoreless game of the tournament in the USA’s overwhelming 129-92 victory over Serbia. Rose finished nine games averaging 4.8 points and 3.1 assists while shooting 25.4 percent and one of 19 on threes, missing his last 17 over the previous eight games. What a triumph this tournament has been for Rose. “I feel great right now. I got a gold without even scoring, man,” Rose said laughing after an exuberant on court post game ceremony when the USA players on the stand receiving their gold medal were showered in torrents of gold and white confetti. “It feels good. 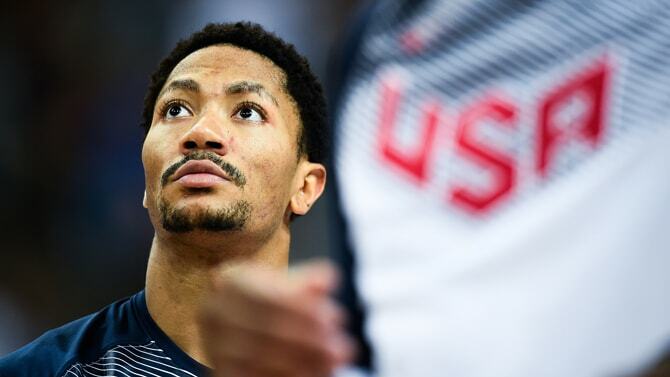 “You know, God does everything for a reason,” said Rose as he met with reporters before the USA team headed back home. “I think this was just a preparation test for me. Just coming here, really learning my routine, becoming a pro. I’m going to transfer this onto the next season with the Bulls because I think this really helped me with recovery wise, taking care of my body, eating right. I was feeling good every time I was stepping on the floor, stretching every time, and I think it’s going to help me with the Bulls season. But you wouldn’t include USA assistant and Bulls coach Tom Thibodeau among them. It’s why Thibodeau was among those who urged Rose to try out for the USA team, and why this experience shows why Rose needs to play more and not less, that instead of being overly cautious he has to be aggressive and compete. The rust dissipates the more you play. It was vital to show that the athleticism and abilities still are there. And now when Rose begins training camp for the Bulls next month after playing nine games in 16 days, the questions no longer have to be about his health. It’s why it makes this tournament a triumph for Rose and the Bulls. USA basketball did pretty well, too, winning by an average of more than 30 points per game winning margin in going 9-0 with the closest game a 21-point win and closing with Sunday’s 37-point blowout. It was something of an anticlimax as the city was preparing for a Spain/USA finale as fans believed Spain was fielding its strongest team. But it was upset by France, which then lost to Serbia. This is a sparkling city, clean and orderly with wide, tree lined boulevards and a potpourri of classic architectural styles and some of the world’s greatest art museums. It’s where Goya painted, Hemingway wrote and, unfortunately, Franco ruled. The USA ruled Sunday after just a brief challenge. Kyrie Irving with a breakout had 26 points with six of six threes in the championship game and was named Most Valuable Player to go along with the MVP trophy he won at this year’s NBA All-Star game. James Harden added 23 points Sunday and was the leading USA scorer in the tournament, averaging 14.2 points. Kenneth Faried averaged 12.4 points and a team leading 7.8 rebounds while DeMarcus Cousins with 11 points and nine rebounds Sunday had his best game of the tournament. Cousins was crucial for the USA team with Anthony Davis in early foul trouble and Serbia taking an early 15-7 lead. But with Cousins physical inside play and outlet passing and Irving getting hot with threes, the USA hit Serbia with a 15-0 run to lead 35-21 after one quarter and never were challenged after that with a 67-41 halftime lead. The USA team after erratic three point shooting much of the tournament made 11 of 16 threes in the first half, including four by Irving, and was 15-30 overall on threes. Serbia was five of 25 as USA players pressured shooters to the end. “This is the first time throughout the whole tournament, I think, we jumped on people in the first half,” said Rose, who played just six minutes in the first half with just one shot as Krzyzewski stayed with the hot Irving at point guard. “We jumped on them pretty good and in the second half we still played with a lot of intensity and our defense was the key to this game. So Rose comfortably became a facilitator, moving the ball for a team high six assists. He missed a pair of pull up threes, had a runner come up short and after a spectacular crossover move lost the ball high off the backboard for his fourth shot. Rose made some terrific passes, including a no look touch pass for a Faried dunk that excited the crowd and a lob to Andre Drummond. Rose again was strong on defense, fighting off a post up attempt and coming up with a strip and several deflections. It’s a formula that Thibodeau is excited about after closely watching Rose these last seven weeks. Thibodeau has spent considerable time counseling Rose, feeding him balls in pregame shooting drills and always in long sessions talking with him after practice. With nine games in this tournament in 16 days that’s one fewer game than Rose played in the NBA the last two seasons. It makes the tournament a terrific head start for 2014-15 for Rose. It also makes some statements for others heading into this season. Anthony Davis showed he’s about to be considered with the elite, though he had trouble with Serbia’s giant Miroslav Raduljica. It shows the slightly built Davis needs to play power forward, where he will be with Omer Asik coming to the Pelicans. Irving had a variety of games with his best Sunday. But he’s at his best controlling the ball, which will be intriguing to meld with LeBron James, who also demands the ball. The tournament win was an automatic qualifier for the 2016 Olympics when James could want to play again for USA Basketball along with Kevin Durant, Carmelo Anthony, Kevin Love, Blake Griffin and Chris Paul, who all opted out and made this USA team a possible underdog. But these players, if not a Dream Team, were one of the more impressive USA teams with the wide winning margin. It wasn’t a good shooting tournament for Stephen Curry, who was frequently in foul trouble and struggling defensively. Teammate Klay Thompson, second on the USA team in scoring despite coming off the bench, showed why the Warriors were reluctant to give him up in trade. Overall, he was the most consistent USA scorer. Harden had major scoring feasts and famines, though got to the basket and drew fouls the most. Though, he, too, likes to control the ball. Faried was the most consistently aggressive and made the occasional shot. His stock will rise in the NBA this season. Cousins showed with a coach he respects he’ll play the right way for him, which is inside and leaving the ball handling and jump shooting to guards. He was better than we’d seen him. We’ve seen Rose better than this. But he looked as fit and fast as ever, which was the major test, as sturdy as the royal Palacio Real, the former home of the royal family, and as artful as the Museo del Prado with the great masterpieces. The structure is there; now he just requires some fine tuning. “We were taking it one shoot around at a time, one practice at a time and one day at a time and I see when you do that, I think that’s the recipe of winning a championship and believing,” said Rose. “I think (Pau Gasol) will make it in Chicago the 22nd or 24th or something like that, and I told him we’ll go out to eat. I haven’t talked to (Pau). I think he’ll be a little disappointed (Spain lost), but he has the Bulls season to look forward to. I think everybody is excited; the city is excited, the players are excited. So I think it should be a good year. We’ve just got to go out there and work hard and play together.